Staircases are a practical requirement in homes with more than one storey. For decades, stairwells have fulfilled an aesthetic purpose that does not necessarily take into consideration staircase space usage and functionality. But exactly how much space can you recover by relocating the staircase? Homeowners typically move or take down walls to modify current rooms, but even more space can be created by relocating basement stairs. It sounds like a big, costly job, and while it may be, the results are usually well worth the investment and effort. If you want to open up your interior space without investing heavily in moving the entire staircase, it may be more practical to take down the walls of the stairwell. Alternatively, you can replace traditional stairs with a floating or spiral style to add a touch of appeal to your home. Homes with narrow, obstructed, and hard to reach loft spaces should consider installing a staircase space saver design. Although the technical aspects to these are, well, technical, they’re essentially slender, steep stairs. With its alternating treads and steep climb design, users can get up a flight of stairs in just half the going distance of a typical flight of chairs. This design is particularly suited for those who want to maximize on their space, like for loft conversions. You should consider whether you intend to replace the conventional wooden stairs with something more contemporary, like glass, metal, or concrete. You should consider the complexity of the project in order to determine whether to involve an architect and a professional team of designers, or to prepare a plan wit just you and a designer. 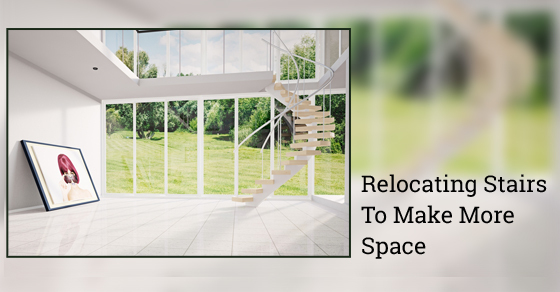 It’s important to create a mental image of how the relocation will occur, in order to identify which walls may need to come down, and whether additional support to the existing structure will be necessary. Removing your walls and changing the location of your staircase can foster the same result: opening up more interior space. But when it comes to stripping your interior, it’s important that you consider changing your floor plan. Ladders, ramps, and stairs must offer safety to users moving between the different levels of your home, so you must prepare yourself for a big job that involves reviewing your home support, if you’re not already planning a large home renovation project. With such involved work, it’s best to work with builders and contractors, as they can help you come up with the easiest and most cost-effective solution to freeing up more space in your home.